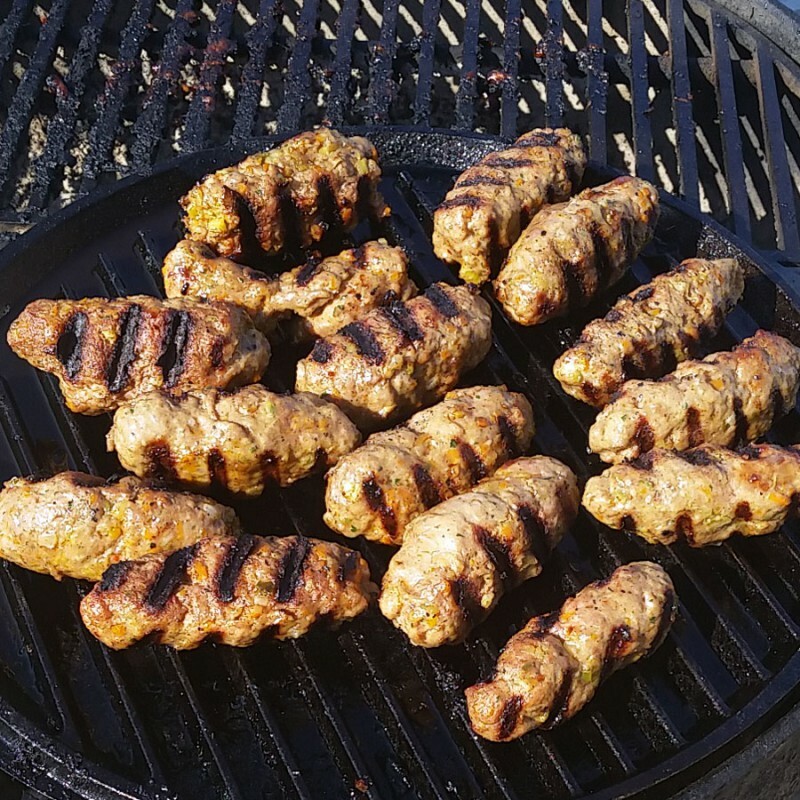 Inspired by cevapcici, a skinless, grilled sausage that originated in the Balkan states. I first had them in Australia and have never seen them in New York. Perhaps I will start a trend? Heat bacon fat in a medium skillet, over medium heat. Add onions and cook for 3 minutes, then add garlic, salt, pepper, and cook until the onions are translucent. If adding chilies, do so and cook for one minute longer. Remove from heat. Put the onion mixture, paprika and parsley in a medium-sized bowl. Mix in the baking soda and then the pork and beef thoroughly. Shape a small flat patty out of a tablespoon of the mixture. Reheat the skillet over medium heat, add a small amount of oil or fat and cook the patty. Cool and taste. If it needs more seasoning, add some as needed. Shape remaining meat mixture into little loaves approximately 4” by 1-1/2”. At a BBQ: Cook meatloaf sausages on a grill or flat top barbecue. At home: Preheat oven to 350 F °. Reheat the skillet over medium heat. Coat the bottom with oil and fat and fry the meatloaf sausages to brown them. Place the sausages on a sheet pan and finish cooking them in the oven for 10 - 15 minutes until cooked through. Traditionally, ćevapčići are served with chopped onions mixed with sour cream, yogurt or mustard. Since mine are “meatloaf” sausages, a more appropriate and American condiment could be gravy or ketchup. I say have them as you like with your favorite condiment.